I am quite possibly the only person from both sides of our families and among our friends who is the most “enthu” (enthusiastic) about the National Day Parades. Wear red? No problem! Wave a flag? I’ll wave TWO! Sing the songs? If I know the words, heck yeah! I’ll probably scream out the words if I can. Nobody can shout “Chan Mali Chan Oi Oi” better than me ok? If I don’t know the words, just fake it with some realistic mumbling lah! Nobody would be the wiser! We were at the stadium super early. Doors weren’t even open yet! Since we had some time to spare, the kids let me take some pre-show photos. The headband on Xander was from Daiso. I originally wanted to post this on my Facebook but it didn’t get converted into those fancy “pan here pan there” VR image. Dunno why. Maybe his face too scary. We could see everything very clearly from our seats. Look at the displays! No excuse to not sing along to all the songs because the lyrics were everywhere! 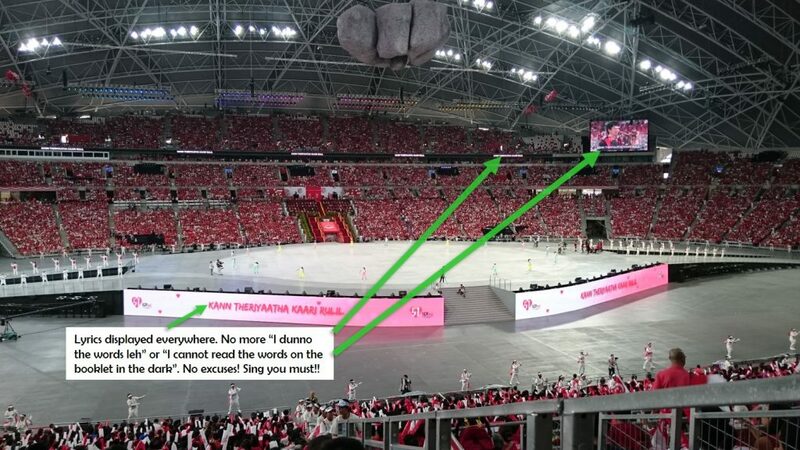 However, there had been so much talk about this year’s NDP at the National Stadium (The Singapore Sports Hub) and most of them not very positive. 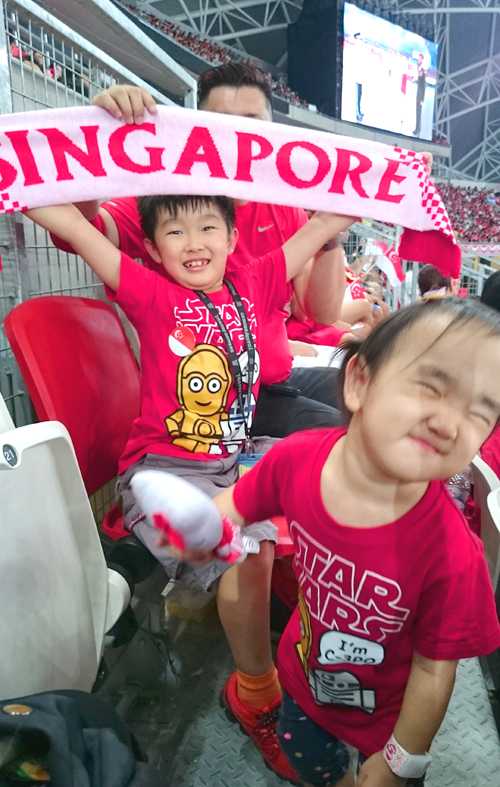 My favourite Red Lions will not be dropping into the National Stadium because of safety issues. No mobile column aka military vehicles and the aerial displays. Bimbo confession: I thought they were talking about some movable structure. *twirls hair* Haha! Cannot see the fly past with the gigantic national flag from inside the stadium. Cannot see the grand external fireworks from inside the stadium. 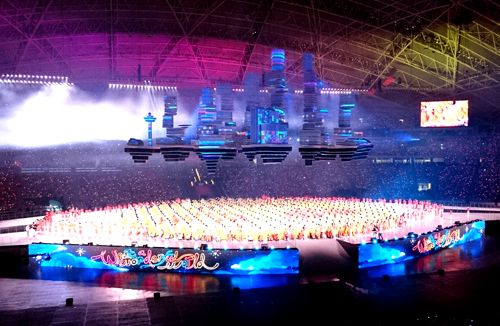 The tok gong retractable roof cannot be retracted during the parade. At first I thought, “Har? No Red Lions? No big big flag? No way! !” These are iconic elements of past parades and I enjoyed ooohing and aahhing for the brave jumpers. I grumbled a bit and then I stopped to think for a bit. Actually change a bit is ok mah. Why is everybody so stuck on the old programme format? 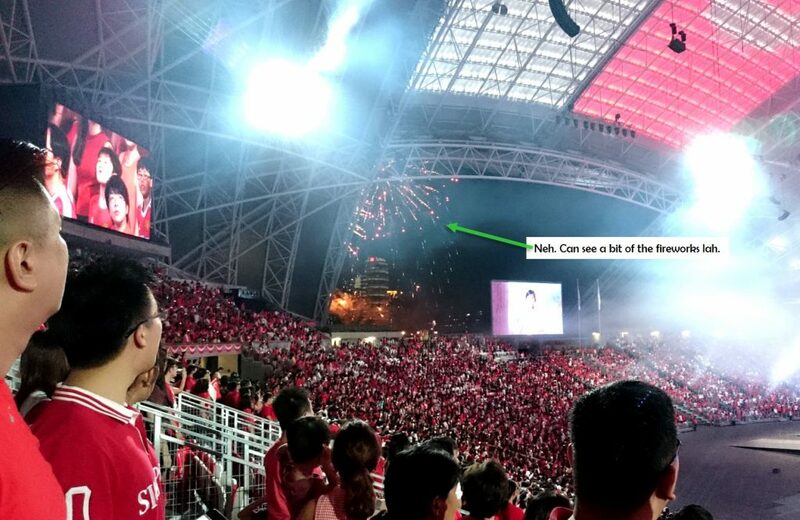 Must we always see the same things during every NDP? You not sian one meh? 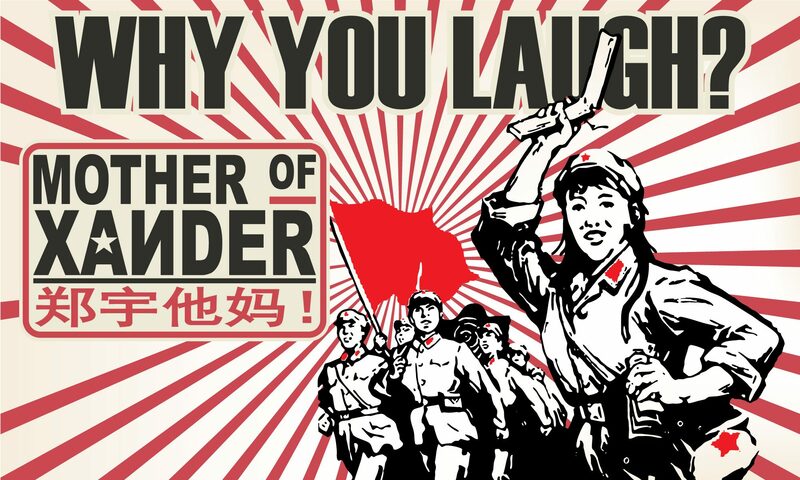 往事只能回味 ok? Weren’t the mobile column supposed to only happen once every 5 years? Last year already have right? Technically, we can still see the fly past but it’s on the big screen. During the national anthem, 6 huge national flags were unfurled and raised by the audience at the seating gallery. The symbolism gave me many feels and good goosebumps. Technically can see the external fireworks through the small opening and on the LCD screens all around us. There were some indoor fireworks too. Yvie was super excited about those and kept screaming to me “WOOK MUMMY! PIREWORKS! PIREWORKS! !” The kid’s screams were louder than the fireworks and it probably shocked the lady in front of her more than the fireworks themselves. Haha! You know ah, if you bear to leave the show early, you can see the fireworks very clearly outside of the stadium. There were equipment hanging off the ceiling so how to retract leh you tell me? This roof is not like your VW convertible’s roof leh, you cannot happy happy anytime want to open close can open close leh. 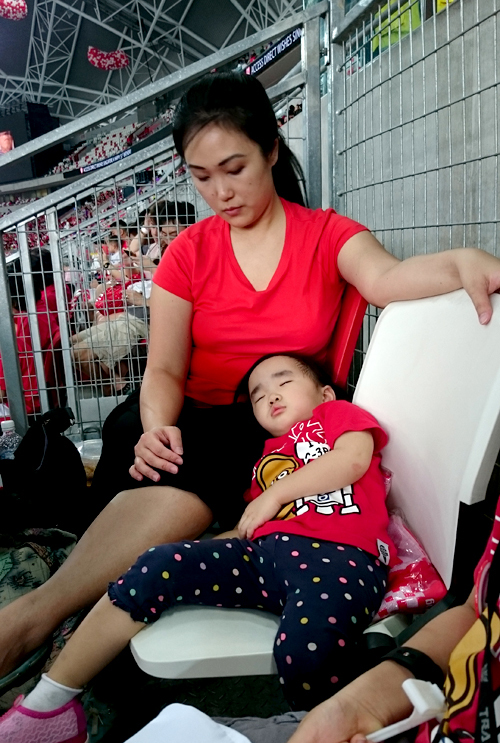 Besides, the stadium got aircon. Your mother never tell you cannot open the windows when you have the aircon on because it will leak out meh? Ok, not the same. Please pardon the crappy quality of the photo. Nah you see the ceiling? How to retract as and when you like leh? We saw a bit of the external fireworks. The Husband helping Xander during the segment when the audience had to sign the words to “Count on Me Singapore”. Learn from the video here. Didn’t know they have the video online until I saw Sengkang Babies’ post the other day. Thanks ah Andy! The post show madness was expected. The Stadium MRT station was so full, we couldn’t get anywhere near it. There were (I am assuming here) NS guys sitting in the middle of nowhere on what looked like umpire’s chairs with loudhailers, trying to keep the spectators updated about the MRT station situation and even tried to entertained them by asking some questions and getting folks to do some practise cheers. Needless to say Kallang Wave Mall was full house too. Be prepared to either leave the show very very early so you can catch the train home peacefully, pack some light dinner to munch during the show (food is also available for purchase at inside the stadium if you feel lazy to bring any) or take your time and linger around until the madness subsides. My photos are limited because my phone camera is so frustratingly lao ya and I shouldn’t give away too many spoilers for those who are going to watch it on the actual day. We enjoyed the show and I think if you go with an open mind and no expectations, you would too. Give the new format a chance lah. I balloted for our tickets the good old fashion way and all opinions expressed are 100% my own. 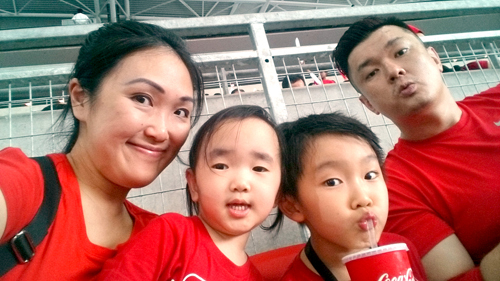 “Wear red? No problem! Wave a flag? I’ll wave TWO! ” lol!!!! We should go together. I went with Poppy, who was a little shy at times. “Don’t sing Chan Mali Chan so loud, Mama”. I also didn’t mind not having the usual stuff and agree that change is good! Was totally amazed that we didn’t feel hot at all during the preview. No fireworks? Ok la, got so many previews and so many opportunities to watch fireworks outside too, right? So many goosebumpy moments for me too. 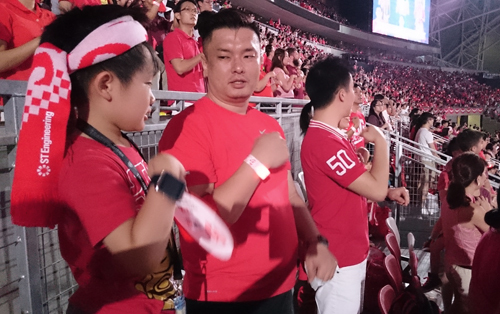 When the Kallang Wave just did not want to stop and people went on and on and on! When the flags rolled out. I think I cry the most at NDPs. Watch at home also can cry! No complaints from us! Not even about the crowd after the show. Got big show, sure got big crowd. Plus, there were people there to give directions (though in a rather haphazard way). We walked a bit more and took the bus so didn’t get stuck in the MRT station. So clever right? Chan mali chan OOI OOI!!! I love love love NDPs! You and me really sama sama leh! Haha!! Poppy so funny lah! She and Xander can sit one side and we 2 can sing and cry our hearts out together! Ya the Kallang Wave!!! It was so awesome during our rehearsal too! NDPs and the songs always give me many feels, especially when I was overseas. Do you remember there was a TV ad about rice and going home for dinner? The first time I saw that online, I cried until I made myself extremely homesick. I am one of those kind. I never doubted your cleverness ever, Adora! Haha ok on. 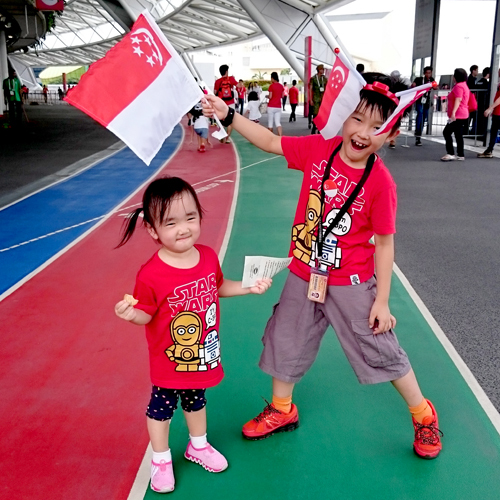 Next time got patriotic event, we go together. You and me and sing and embarrass the kids, and they can stand in one corner and shake their heads at us!